The smallest City-State in the world. Reach in amazing art, history and tradition. 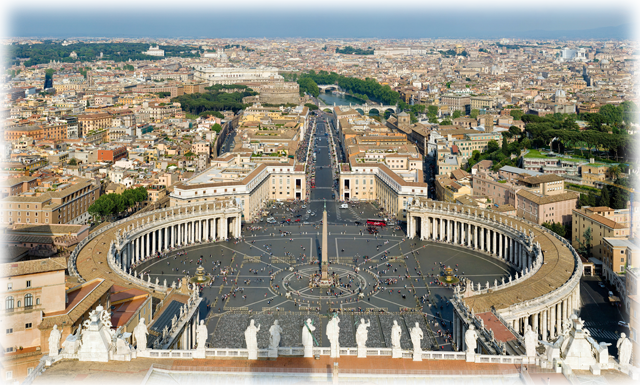 From the Vatican Museums, to the enchanting Sistine Chapel, ending with the grandeur of Saint Peter’s Basilica and its Square. MEETING TIME // 8:00 am or 01:00 pm. VISITED SITES // Vatican Museums, Sistine Chapel and Saint Peter’s Basilica. NOTES // please wear comfortable shoes. The tour, once reached the first site, would be entirely on foot. Once met at accommodation, your guide will decide with you what kind of public transportation to opt for in order to reach the first site. Most of the times it will be taxi rides whose cost would be on you. Shoulders and knees covered as it is considered a religious site. Please advise if group over 8 people as cost will change. EXTRAS // 28 euro per person for VIP entrance tickets. For groups above 6 please add 3 euro per person for headsets which are mandatory inside the Sistine Chapel and Basilica. We cannot be held responsible for sudden closure of St Peter’s Basilica due to internal political events. Tip is well accepted by our guides.